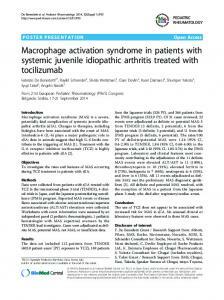 juvenile idiopathic arthritis (SoJIA) with macrophage ... diseases, especially systemic-onset juvenile idiopathic .... dermatomyositis, and Kawasaki disease. 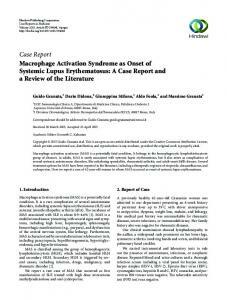 Sep 15, 2008 - Successful use of Infliximab in macrophage activation syndrome with severe CNS affection. A Sellmer*1,2,3, B StausbÃ¸l-GrÃ¸n1 and T Herlin1. 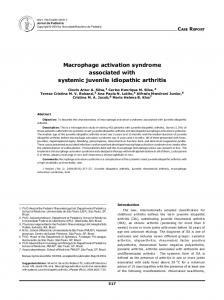 symptoms in girls with Turner's syndrome (TS) ... Eleven girls with TS, 9-17 years of age, all,with ..... Downey J, Ehrhardt AA, Gruen R, Bell JJ, Morishima. necrobiotic tumor cells. 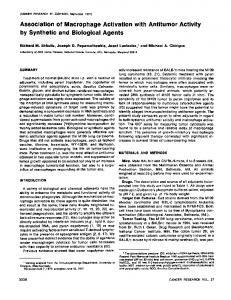 Similarly, macrophages were re covered from pyran-treated animals, which potently ar rested DNA synthesis of M109 tumor cells in vitro. N. Iagăru1, D. Orăşeanu2, F. Rusu2, Monica Luminos3, Anca Drăgănescu3, Anca Ghiţă1 “Alfred Rusescu” Children Hospital “Gr. Alexandrescu” Children Emergency Hospital 3. 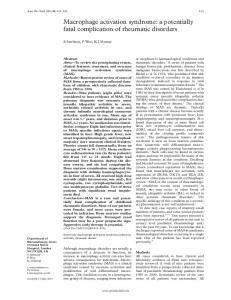 “Matei Balş” National Institute for Infectious Diseases 1. 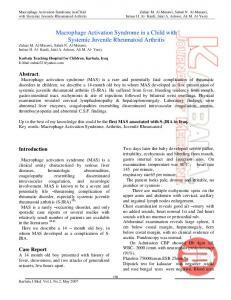 2.
mimic the clinical and laboratory features of the underlying disease [2-5]. 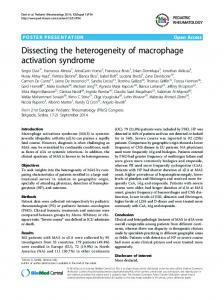 Macrophage activation syndrome is characterized by pancytopenia, liver insufficiency, coagulopathy, and neurologic symptoms and is thought to be caused by the activation and uncontrolled proliferation of T lymphocytes and well-differentiated macrophages, leading to widespread hemophagocytosis and cytokine overproduction [1,2,6]. 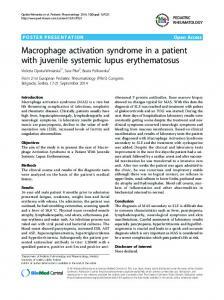 Methods We report two cases of 15- and 10-year-old females with MAS in juvenile SLE occurring acutely in the first 6 months after the onset at the time of first presentation in our hospital. 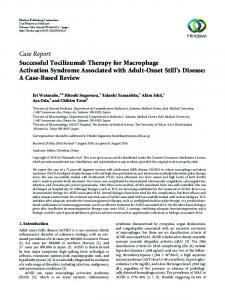 The clinical features and laboratory data of SLE were analyzed. 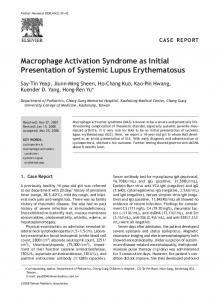 The main laboratory findings of macrophage activation syndrome were identified: pancytopenia, abnormal serum hepatic enzyme levels, coagulopathy, neurologic symptoms, hyperferritinemia, hypertriglyceridemia, decreased erythrocyte sedimentation rate, hyponatremia, hypoalbuminemia and macrophage hemophagocytosis in the bone marrow aspirate sample. 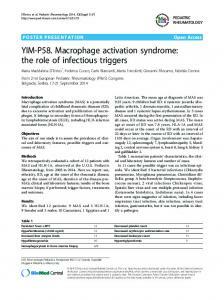 Report "macrophage activation syndrome in two girls with ..."